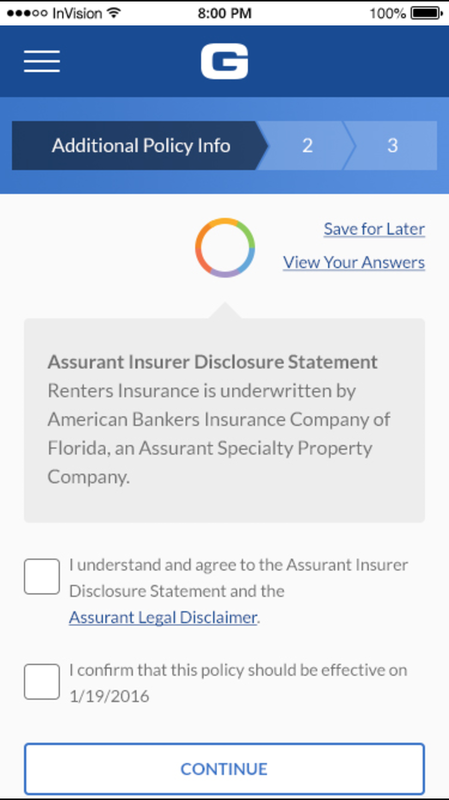 The goal of the project was to take a normal form and convert it to a more conversational tone to get a renter’s insurance quote. Time Frame: From initial ideation session to the first implementation was 8 months. The project has since continued. For this project I had the responsibilities of a UX Researcher, Project Manager, and Experience Designer. 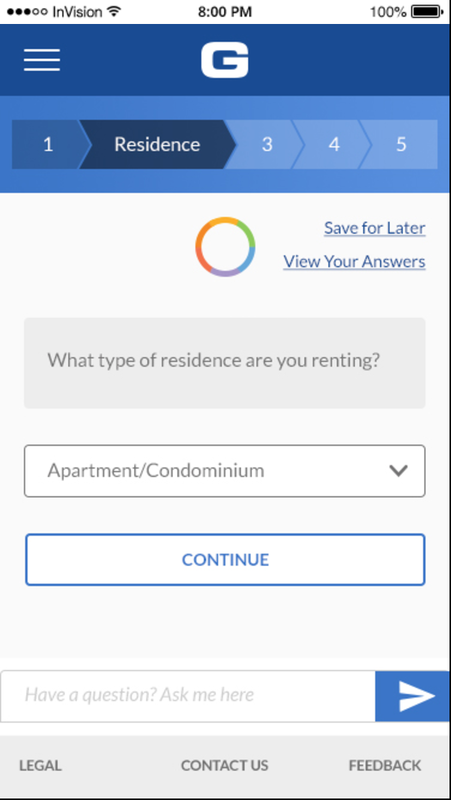 After the focus group, I worked with our UX intern to wireframe out 3 completely separate experiences ranging from more of a widget/traditional form to a full on chat like experience. We then prototyped out all three of these experiences and tested them against each other with the goal to find the right balance of forms and a conversational flow. Full Conversational Model. This experience was intended to test only having one input to both ask questions and to answer the question given. Complete the form as you go. This version was testing showing the customer the completion of the form while they are filling it out. Widget model. This form tested having easy to click buttons and easy access to help from the virtual assistant. We also played around with a quote estimator that would get more accurate as you went through the quote process. After getting the results from the User Testing back, we worked to take the elements that worked well from the 3 experiences and integrate them with the full list of requirements from the project team. We had to include (amongst other things) ways to save the quote at any point, a way to see all answers without having to ask, ways to handle legal text and a progress bar. We presented our designs to the business team along with the reasoning behind the choices. They liked the design but wanted to try something a little more chat based to really test the technology. They also wanted something that would translate into an IVR solution. We went back to the drawing board, researched what was out there, worked with our development team and came up with a more chat based version to test.